MANILA, Philippines - Malacañang spokesperson laughingly commented when asked about the suggestion of a congressman who wants to turn the monument of Jose Rizal at Luneta Park to end the issue of " photobombs " Torre de Manila condominium. Deputy presidential spokesperson Abigail Valte said that the monument of Rizal should not be disturb. 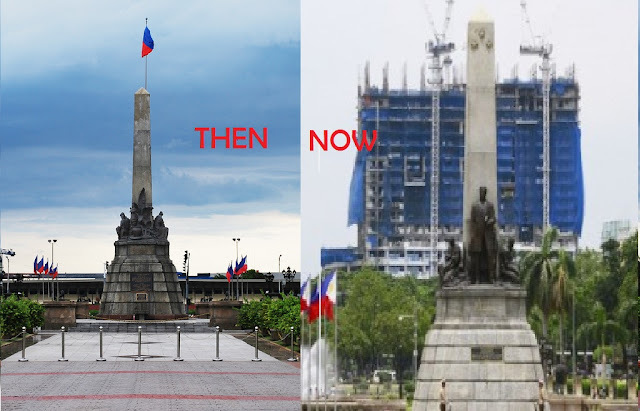 Maybe we should not disturb Rizal 's monument in order to regulate the issue about there? Let 's leave the monument be, "said the spokesman of the Palace . An earlier, proposal by Rep. Amado Bagatsing to turn to the monument of Rizal facing Manila and facing behind the sea. In this way , the sea will be the new background of the monument of Rizal and instead of the controversial condominium building built by DMCI Homes. But Bagatsing 's proposal was opposed by the National Commission on Culture and the Arts ( NCCA) Rizal monument was deliberately presented to face the manila bay. Take a look at real state that are facing watershed [ riverside ], ocean side, seaside properties. They are more valuable. So we offered to Rizal most valuable real estate in the country, said lawyer Trixie Angeles of NCCA. A temporary restraining order from the Supreme Court, has be issued to stop the construction of the building while DMCI hear the petition on the matter. The condominium “Torre de Manila”, has been in the controversy after it became a photo bomber in Rizal Park view. Many people believe that the said building makes a pejorative view of Luneta Park. Past Manila City Mayor and present Mayor are blaming each other on who authorized and why they let the building to be constructed without studying first and the situation it might bring? Several people are advising that the photo bomber building should be demolished to resolve all problems? No Comment to " Rizal Monument In Luneta Park, Should Not Be Disturb To Avoid Photo Bombers "